If Changes (Nothing to Lose) acted as a teaser for this release, it only hinted at what musical treats were going to be served up with the elbowroom that a full-blown album affords. And although Everything Changed stays within the template described by that first release, meandering between contemporary dance floor commerciality and the ingrained soulfulness of a more honest time, it does nothing less than owns the genres it splices together. Between the infectious funk of Blood Out of A Stone, the dynamism yet reflective soulfulness of Behind Closed Doors and Time Wasters, a song that is so of the now it almost sounds futuristic, the album becomes a vital lesson in making a dance record. Not only does this album celebrate the history of dance music, infusing the timeless sounds of Motown, funk and soul with the slick and sassy strut of the digital age, wonderful textures and layered harmonies with more minimalist approaches it also never over plays its hand and always offers something fresh with each song. 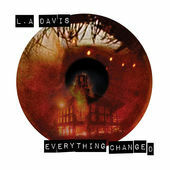 The sign of how great an album Davis has created here is borne out by the fact that it already sounds like a greatest hits album, each track having the hall mark of a classic single release and if you can do that with your debut album, imagine what lays in store for the future.